Last week J and I had Thanksgiving dinner at the Top of the Hub, just as we did last year. One of the things I’m grateful for is the place we live: Newton is a sleepy suburb of Boston, so it’s a quick trip into the city for culture and back home for quiet. When I lived in New Hampshire, I told myself I’d move back to Boston in a heartbeat if I could afford a way to live there, and some ten years later I find myself living just outside a city I loved at first sight. I can’t overstate the amazement I feel whenever I realize how far I’ve come from my childhood in Columbus, Ohio. Ohio, I sometimes say half-ironically, is a great place to be from; Boston, on the other hand, is a place other folks go to. Hailing from flyover country, I still feel like pinching myself when realize I live in a city other people visit on vacation. 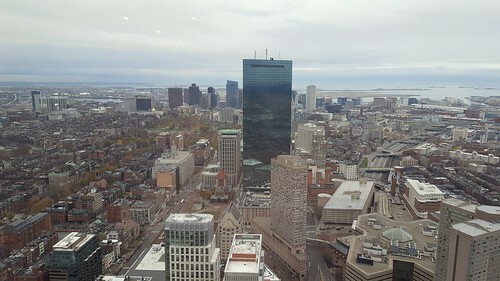 Thanksgiving Day was gray and drizzly, so after J and I parked on a holiday-empty Back Bay side-street, we walked directly to the Prudential Center, window-shopping the indoor mall there before heading to the Skywalk Observatory on the 50th floor. Viewed from above, Boston is a crowded tangle of streets and sidewalks: “How could people ever live there,” I can imagine newcomers wondering. But when I lived in a basement apartment in Beacon Hill more than a decade ago, Boston was entirely livable, a place I knew by heart and by foot. Looking at Boston from above is like looking at a map, and when I look at maps of Boston, I invariably juxtapose my own muscle-memories of walking these streets and sidewalks. Here along the Charles is the Esplanade where I’d sit in the sun and write letters home, there is the Public Garden where I’d watch skulking ovenbirds and warblers before heading to campus, and over there is the Christian Science reflecting pool, where I’d spend a quiet moment on my way from the Boston Public Library. Most maps include a marker that says “You Are Here,” but the map that is Boston viewed from above reminds me where I was and were I came from: the long, winding route that led me here and all the places I’ve been along the way. I couldn’t tell you if I tried how to drive in Boston, since I didn’t have a car when I lived there. But I can tell you how to navigate the T and how to avoid being jostled on crowded sidewalks, and I remember with eyes closed the secret shortcuts only locals know. i have been in the mother church but couldn’t remember the reflecting pool, then across all those years the memory came back, i thought of walking the whole length but it was too far and i was tired from traipsing around central boston went inside the church which is plastered with quotes of mary eddy baker and i remember thinking, well this is the same stuff as zen is about but couldn’t discuss it at the cambridge zen center, people just seemed to get confused as soon as you went outside the boundaries . .